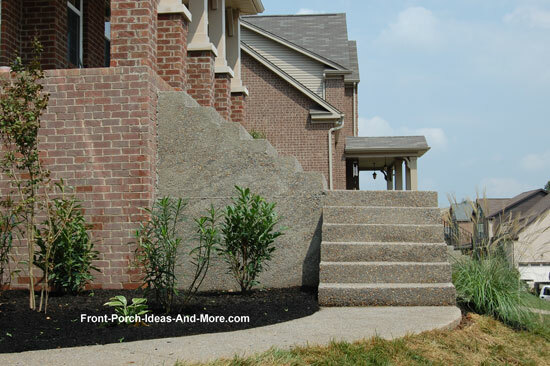 We hope our building concrete steps pictorial and guide will give you the necessary information upon which to decide if this project is within your capabilities. 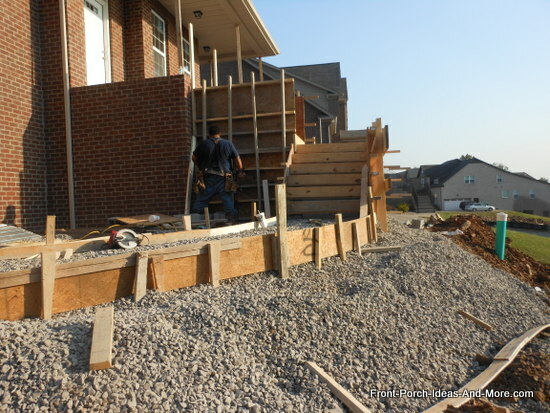 As you will see, the most critical component is ensuring the framing is sufficient to hold the wet concrete in place until it dries. 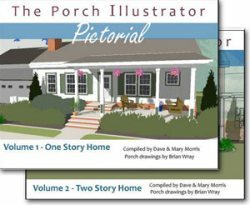 Mary and I have been documenting the process for constructing concrete flooring for a front porch, the concrete steps, and a walkway to give you an up close and pictorial view of exactly how it is done. 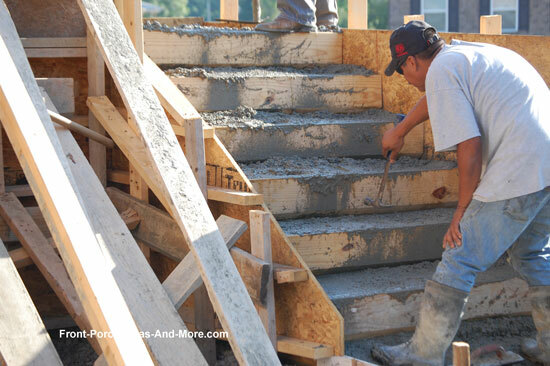 In this section, we will show you how to build concrete steps with an aggregate finish. 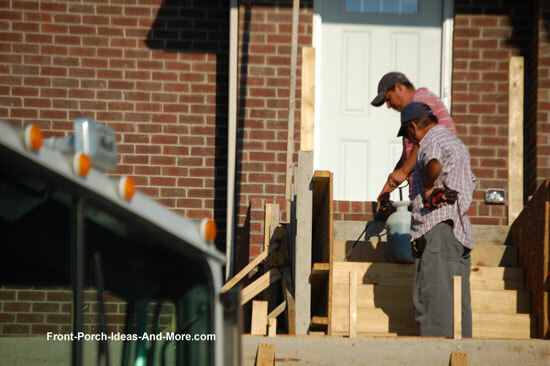 The first step in the process was to squarely position the porch steps. 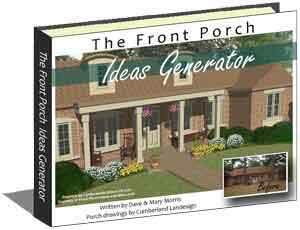 In this case the homeowner wanted the steps positioned on the front door. 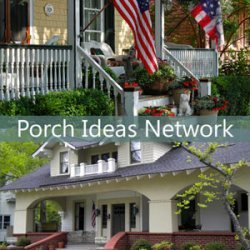 Finding the midpoint of the front door opening and extrapolating that point to the outside porch wall will give you the center of the step. 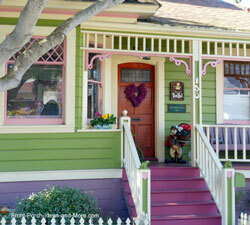 Once you have marked the midpoint you can then find the outer edges of the porch steps. 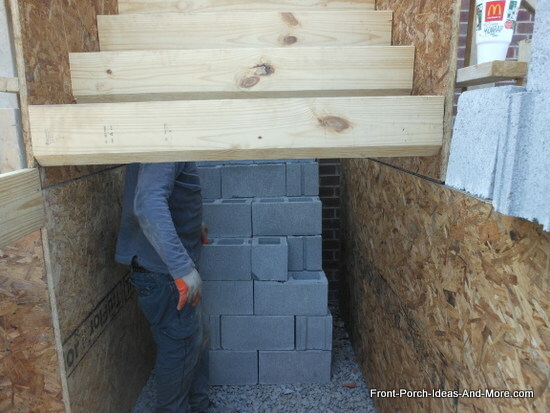 The next step is to align a square down the front of the porch wall as shown below, keeping in mind that you have to allow for the plywood form. 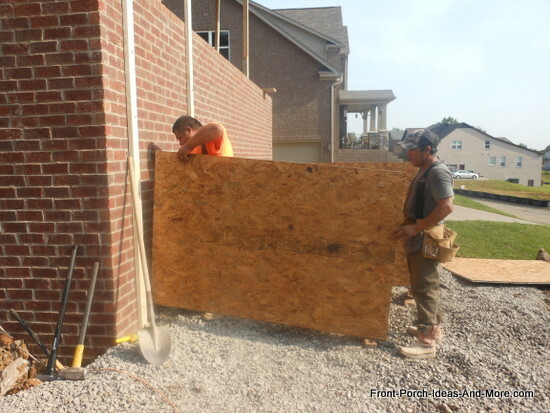 Draw a line down the wall and use that line to fasten 2x4 framing as shown. Repeat the process on the other side. 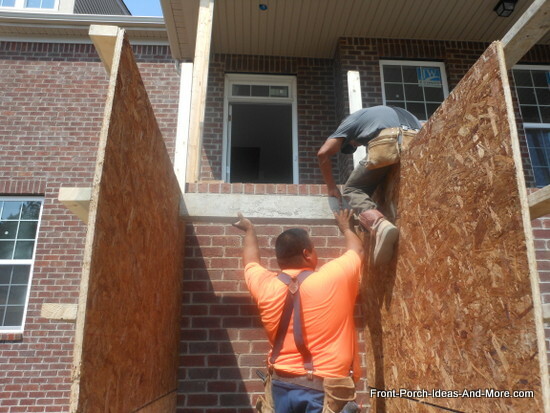 In lieu of erecting the plywood forms and then measuring and marking the rise and run for stringers when building concrete steps, it is easier to lay it out before fastening the plywood as shown below. This is a critical step in the process and if doing so yourself, recommend you measure more than once to make sure it is correct. 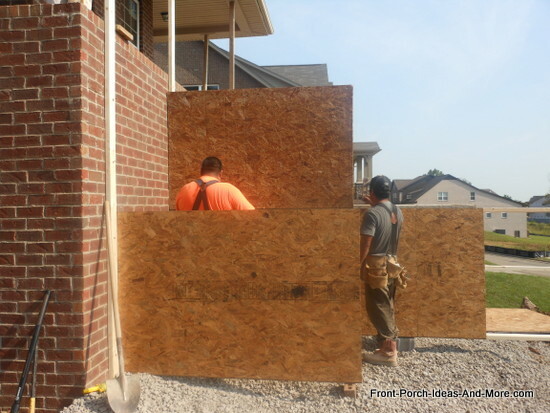 Now they began to attach the plywood to the 2x4 framing by nailing it in place. 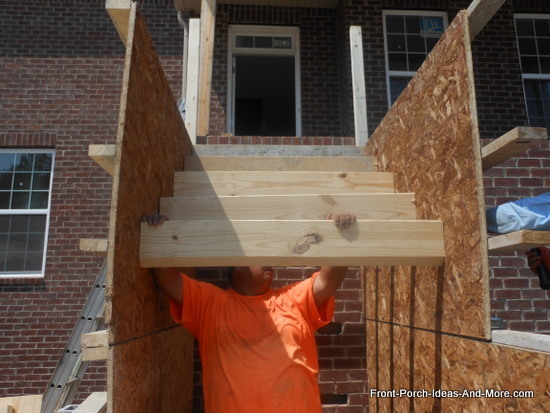 Because of the height of this porch, another section of plywood must be added. 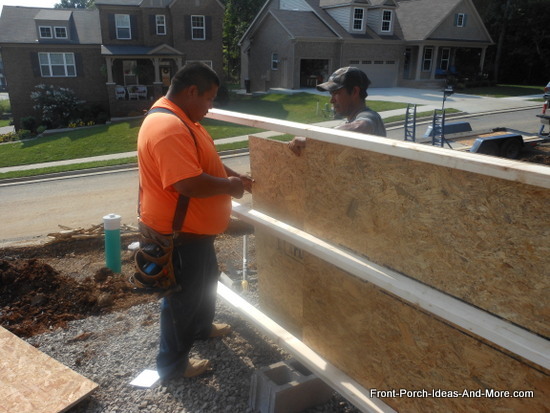 Again, they marked the stringer placement on the plywood before they attached it to the framing. 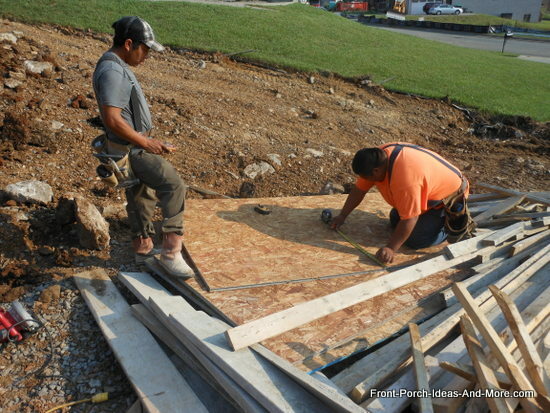 They began reinforcing the plywood sheets by attaching 2x4s horizontally across the plywood to prevent it from bowing until the concrete dries. Notice the 2x4 top plate. That is added onto which they will affix the upper plywood panel. 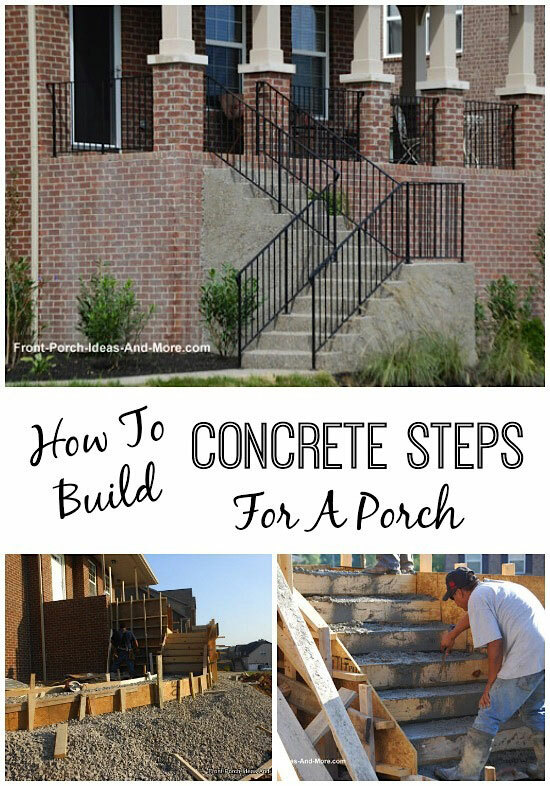 When building concrete steps it may be necessary to attach them to the brick facing on the porch. 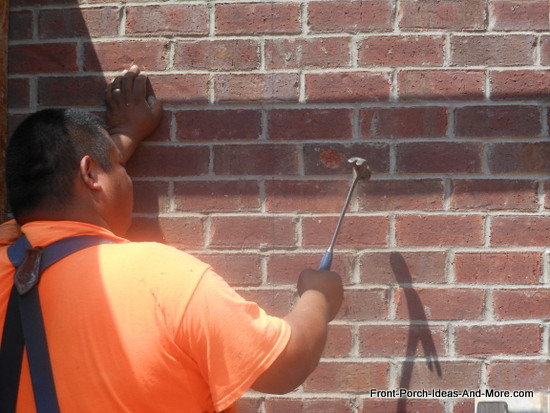 Once the plywood panels were in place, they began hammering out the brick along the the porch wall. 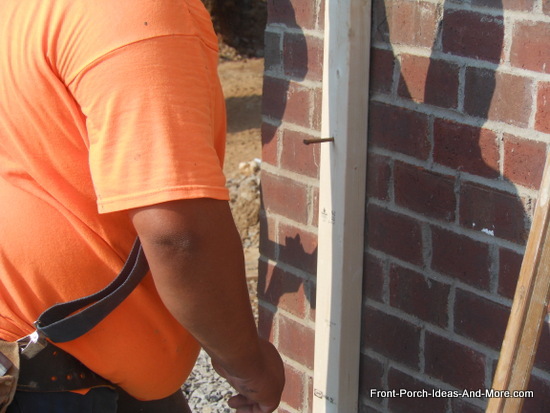 The holes, placed strategically down the wall will later be filled with concrete thereby attaching the steps to the porch's brick wall. 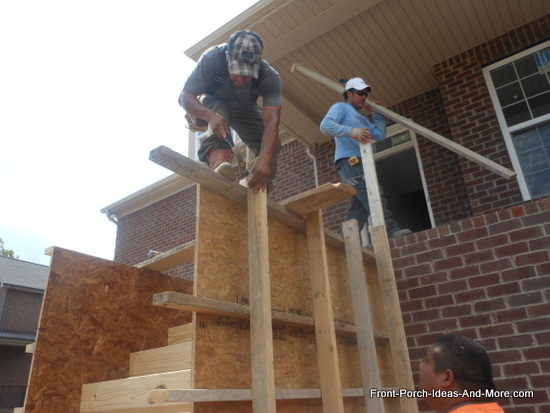 After erecting the plywood panels, they began installing the framing for the risers on the steps. Each piece is cut to length and nailed into position using the rise and run lines they had previously marked on the panels. NOTE: Notice how the bottom of the risers are cut at a 45 degree angle. 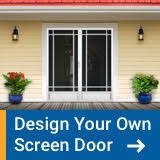 This is a necessary step as if not done, you won't be able to seamlessly join one to step to the other. 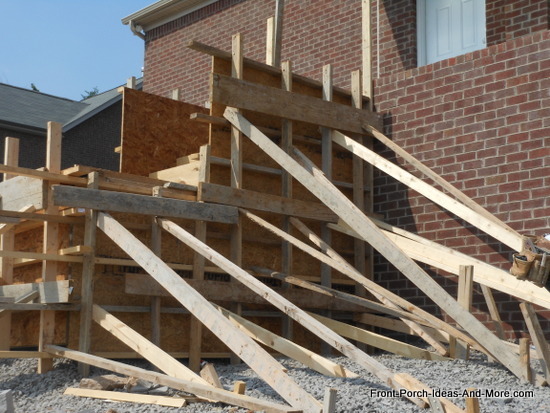 Once the risers and forms were in place they began reinforcing the entire structure by adding 2x4s vertically and bracing the walls as shown. 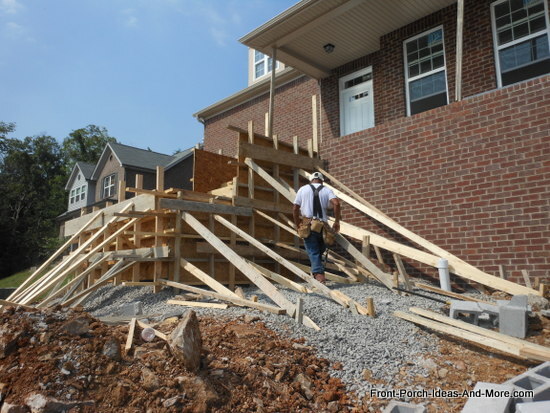 This perhaps, is one of the most critical components in the process to ensure the concrete steps are formed correctly. 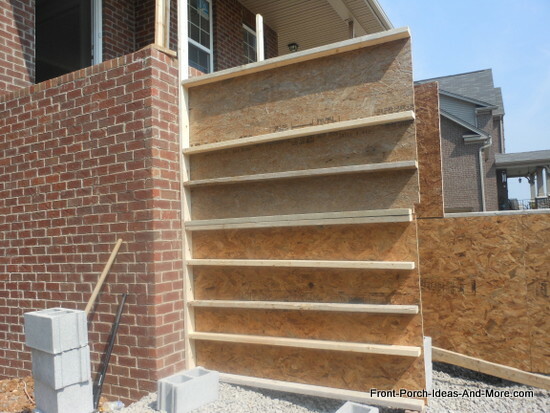 No matter the size of your concrete steps you just can't brace too much. 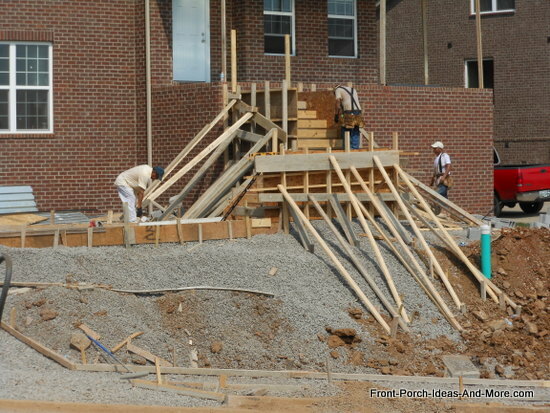 They then began to build concrete steps for the lower section in the same manner as the upper portion. 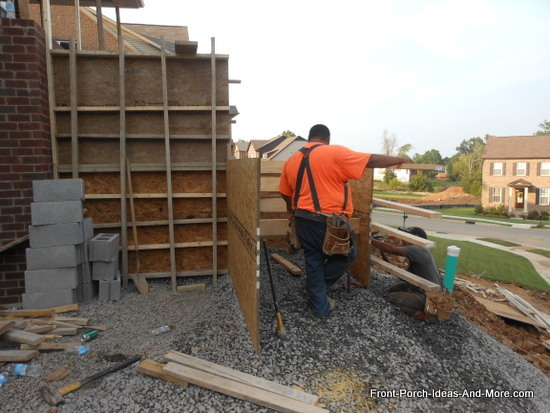 With the porch steps framed, the next step was to fill the cavities between the forms with concrete blocks onto which concrete will be poured. 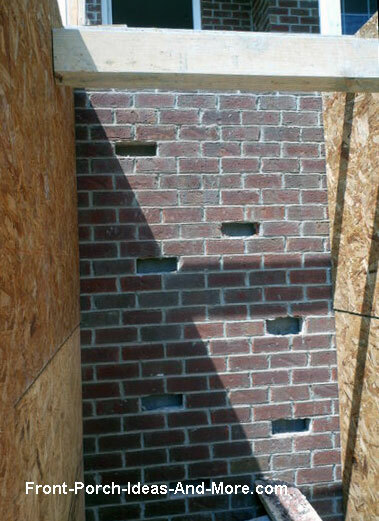 The concrete blocks only fill the center of the cavity from bottom to top. 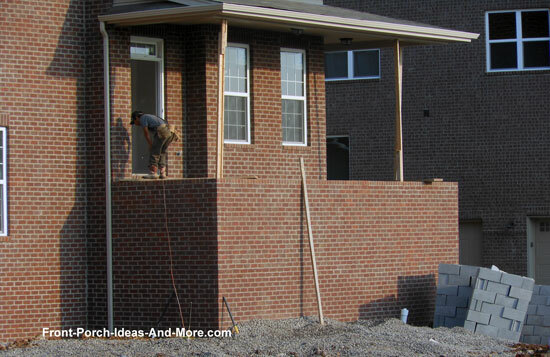 The last step in the concrete-porch-steps construction is to reinforce the entire structure. Once the concrete starts pouring, there is no recourse. 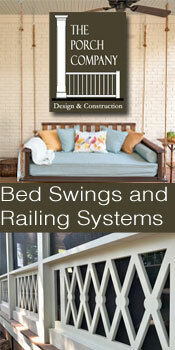 Therefore, the structure must be substantially reinforced to hold the weight and not create any bulges, gaps, etc. 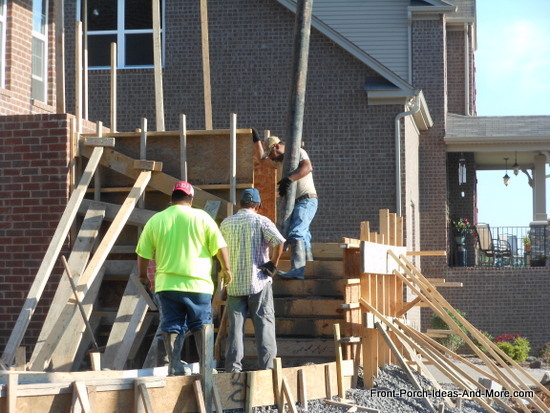 There is a lot of steps involved in building concrete steps so it is always good to see the concrete and pumping truck arrive. Almost done. 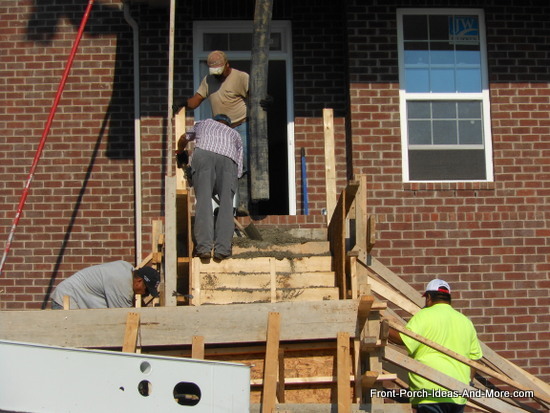 As the concrete is being poured into the form, workers ensure it is spread evenly to fill any gaps or voids. 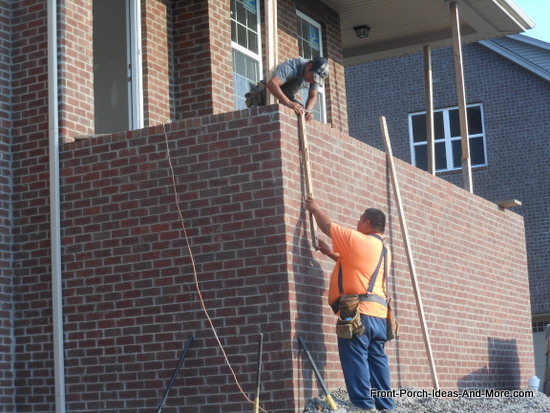 Also note that workers also continue to monitor and add additional bracing as required to maintain the integrity of the form. 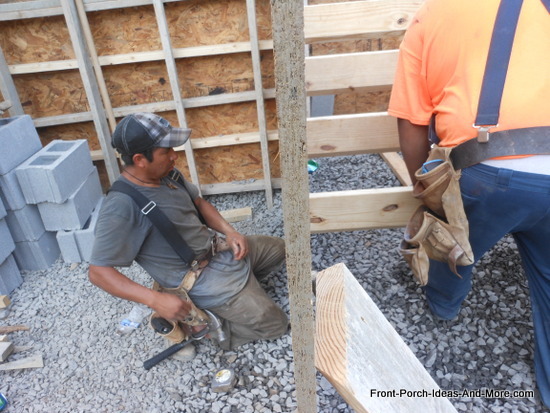 Since these are going to be aggregate porch steps, a concrete surface retarder is applied. 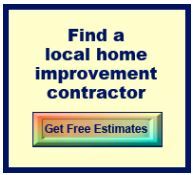 This delays the hardening of the surface so it can later be hosed downed to expose the aggregate stone. 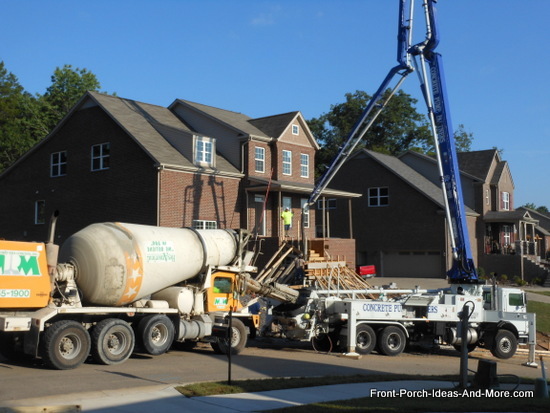 See our guide to concrete porch flooring for more information about applying the concrete surface retarder. 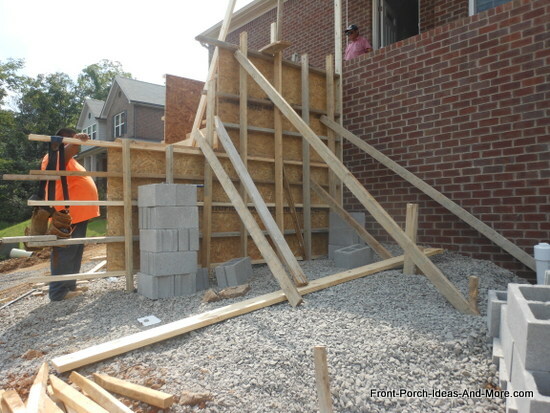 When the concrete hardens the forms are removed and the porch steps are exposed. 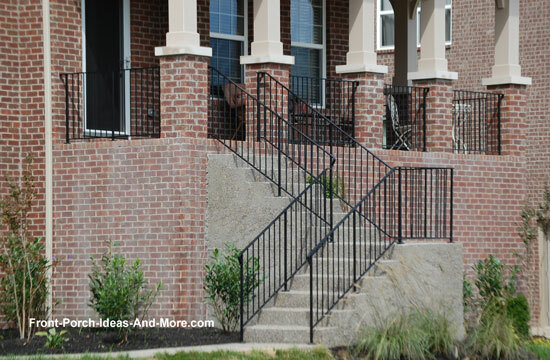 As a finishing step, wrought iron railings were added. 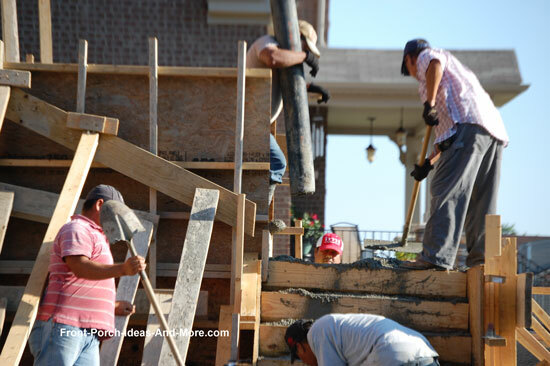 Building concrete steps is quite a project and hopefully you now have a better understanding of what is involved. 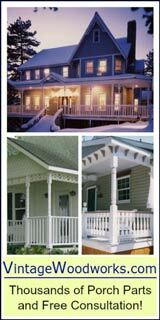 Be sure to see more of our concrete porch options below.